I have traveled to Chicago over 40 times for business and family. I’ve enjoyed concerts in Millennium Park on warm summer evenings and dressed for the Antarctic on winter nights when the wind chill was minus 70. Chicago is one of our Top 10 Walkable Cities. With 2.7 million living in the city and 10 million in the region, the city has a long history of urban innovation from being the first city with skyscrapers to having the most green roofs to now leading in smart city technology. Cities are enthusiastic about smart city technology, but also constrained by budgets, stakeholder conflicts, and evolving technology. Chicago’s best smart city initiative is the installation of 270,000 smart street lights that quickly pay for themselves by saving energy and in saving millions in maintenance. Of the 300 million streetlights in the world, few use efficient LED lighting and very few use the Internet of Things (IoT) that can leverage their value and create a path to smart cities. According to lighting provider Acuity, 12.5 million U.S. street lights are now LED. By 2026, 73 million are forecasted. Ninety-five percent of U.S. street lights use old-fashion dusk-to-dawn controls. Only one million U.S. street lights are smart-city enabled with IoT. Chicago’s Smart Lighting Project with 270,000 IoT-connected LED lights is a huge step forward. Chicago may cut its annual energy cost for street lighting by 60 percent. Millions more will be saved by not using expensive trucks and labor to patrol streets looking for burned-out bulbs. Using the internet of things (IoT), the light poles will include sensors and wireless communication and communicate when an LED light needs replacing. To improve safety, the light poles will be integrated with the city’s 311 system, which provides a portal for access to city services. In the future, street lighting may also be integrated into the 911 system. Argonne National Laboratory, headquartered in Chicago, is a partner in making some of the street lights much smarter. Fourteen-inch cylinders with multiple sensors and cameras will be attached to some poles. This will lead to data about everything from heat islands to asthma clusters. The project, named the Array of Things, has 500 installations including some street lights. In the future, the light poles could include other safety features like cameras, motion detection, recognition of people screaming for help, and gunshot detection sensors. Along with sensors and data that facilitate health and safety, comes the concern of lost privacy. Chicago’s smart lighting project is facilitating an IoT platform for broad Smart City initiatives. In the future, some light poles could be upgraded to street kiosks. With sensors and IoT, added data can be collected at 270,000 points in the city. The city already has 600 data sets on its open data portal for planners and app partners. Rich in data, the city has the foundation for a smart city platform. With open data, the city is not going it alone with only its own money. A wealth of open data is leading to open source projects and strategic partnerships. Mayor Rahm Emanuel has stated that he wants to transform Chicago into “the most data-driven government in the world.” That means it must catch and pass the leadership of cities such as Barcelona, Copenhagen, London and Singapore. Microsoft is a partner in City Digital. One pilot project uses sensors to test “green” ways to curtail urban flooding, and reduce pollution flowing into the Chicago River and Lake Michigan. Another pilot uses sonar technology to produce virtual maps of the mess of cables and pipes beneath the city’s streets, potentially lowering maintenance and construction costs for many vendors. With rich data, analytics and machine learning can model where to best improve traffic flow, reduce flooding, improve water quality, and respond to health risks. Rich in local data, with apps and web services, people can find stores, restaurants, and child care. They can map safe walks, bike-friendly rides, and park paths for winter cross-country skiing. Smart city technology can dynamically adjust parking pricing to demand, allow people to find the best available and lowest cost parking, and give apps data to guide people to the least cost parking. Reduced driving and congestion result. Chicago Transit Authority makes bus travel faster by using transit signal priority (TSP) on priority corridors. With TSP lights turn green sooner as buses approach and stay green until the bus has cleared the intersection. In the future, more sophisticated vehicle to grid and to vehicle to vehicle (V2X) will enable autonomous cars and shuttles to move faster and safer through the city, reducing congestion. These vehicles could be routed along rodes with inductive charging and parked remotely off-peak. Smart mobility will be dimension in making Chicago a smart city. Like most other cities, Chicago needs faster broadband networks for V2X success. Broadband may come from Wi-Max or 5G networks. Fast networks with low-latency response are needed by all cities for full smart city implementations. 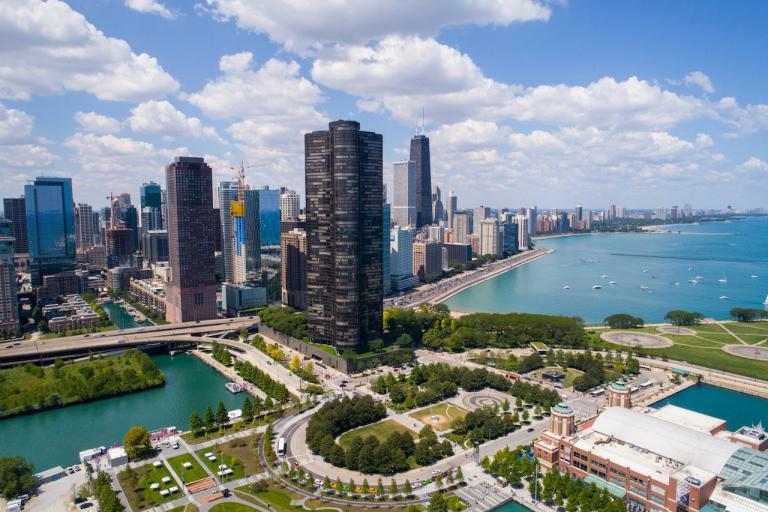 Chicago’s Smart Lighting Project with 270,000 IoT-connected LED lights is an excellent step forward in scope and in advancing smart-city data and IoT infrastructure. Chicago’s smart city progress will be advanced by projects that provide a fast return on investment, improve safety and health. With smart lighting, IoT, and 600 data sets open-sourced, Chicago and its partners have a platform to keep extending Chicago’s Smart City leadership.